Molly Brown London uses a variety of precious metals, freshwater and cultured pearls, precious and coloured gemstones within the Collections. It is recommended that you store your jewellery in the pouch and box provided at purchase to reduce the risk of damage and air pollution affecting its appearance. If you are purchasing a gift to be worn in the future or are planning to store it for long periods of time, we recommend that you store your jewellery in a sealable, air-tight polybag with an anti-tarnish strip. Please follow the following advice for care of particular materials to ensure your jewellery remains in the beautiful condition you receive it in. 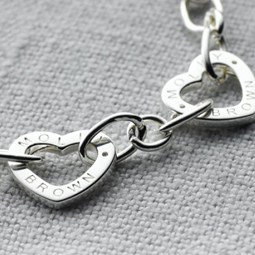 Molly Brown jewellery is hallmarked in the UK at the Assay Office, fulfilling the requirements established by the Law on Precious Metals. This is a guarantee to our customers of the purity and quality of the metals used in the collections. 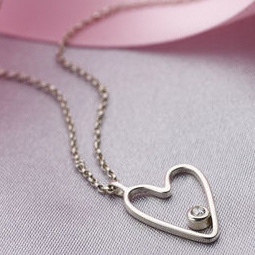 All Sterling Silver is prone to natural tarnishing. This natural process is caused by oxygen and moisture coming into contact with the metal. This can be treated by polishing or buffing with a soft cloth. When cleaning silver jewellery it is a good idea to buy a cleaning cloth from a respected brand name and like gold, it is susceptible to damage by chlorine. Sterling silver jewellery is best stored in a plastic sealed bag so as not to be exposed to the oxygen and moisture in the air. As a natural product pearls need to be carefully looked after. 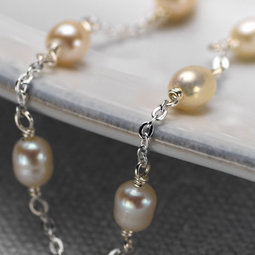 Pearls can be cleaned using a soft lint-free cloth dampened with water, allowing the pearls to air-dry before putting away. Pearl care is vitally important and pearls should be stored separately from other pieces of jewellery as they can scratch easily. Store in the jewellery pouch provided with purchase as opposed to in plastic bags. Particular care should be taken not to use chemical or harsh cleaning substances. 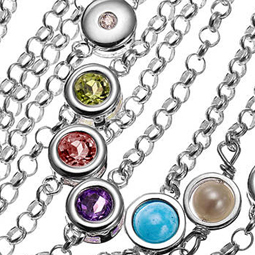 Ideally gemstones and gemstone jewellery can be cleaned with warm water and gently buffed using a soft lint free cloth. Try to ensure gemstones are not knocked when worn or stored to avoid scratching; we suggest storing each piece separately in the jewellery pouch provided with purchase. 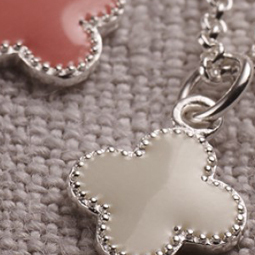 Molly Brown London uses cold enamelling for its enamel charms and enamel pendants. This enamel is very durable and can be cleaned using a soft cloth and warm water. Harsh chemicals and jewellery cleaning products should not be used with enamel jewellery as this can affect the colour of the enamel. Care should be taken to protect enamel from scratching or chipping and therefore enamel jewellery should be stored carefully in the silk pouch provided with purchase. Although diamonds can only be cut by another diamond, they are still susceptible to fractures from sharp blows. You should always try to protect your jewellery from harsh blows and not wear diamond jewellery when doing rough work. Since diamonds can be affected by other diamonds, take care when wearing or storing jewellery together, to avoid scratching to the surface. We suggest storing each piece separately in the jewellery pouches provided with purchase. Try to handle your diamonds sparingly so as to avoid the oil from your skin altering its appearance and clean regularly using warm, soapy water and a soft toothbrush should it start to look dull. Always rinse properly after cleaning. 9ct gold tends to be the most resistant to scratching and can be easily cleaned using a soft lint free cloth to maintain shine and lustre. Chlorine can permanently damage gold jewellery and can cause serious damage to gold-plated (gold vermeil) jewellery. Always store jewellery safely and securely when not being worn. 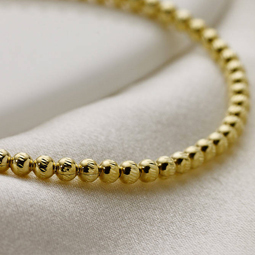 Gold vermeil jewellery is sterling silver jewellery plated with a thin layer of gold and hallmarked as sterling silver. To protect your gold vermeil jewellery, do not wear whilst you are wearing perfumes, body lotions and do not expose to water. Always remove gold vermeil jewellery before swimming. Protect your gold vermeil jewellery from scratching by storing in the soft jewellery pouch provided by Molly B Couture and store this in a plastic sealed bag, so as not to expose the jewellery to oxygen and moisture in the air.